NOTE: This blog post was written on December 28, 2014. A few days ago, I told you about all the awesome people I’ve met and will meet in my path through life. Unfortunately, because of my professions (first as a lab tech, then as an epidemiologist) and because of my current work towards a Doctor of Public Health degree, I’ve also managed to pick up some enemies. Yes, “enemies” is a strong word, but there is no better way for me to describe some of these people. They have tried to get me fired from earlier jobs, tried to find out where I live, and have said all sorts of interesting things about me online. They won’t say it to my face for some reason. They also won’t put it in writing in emails when I’ve emailed them and asked them to repeat what they wrote online. 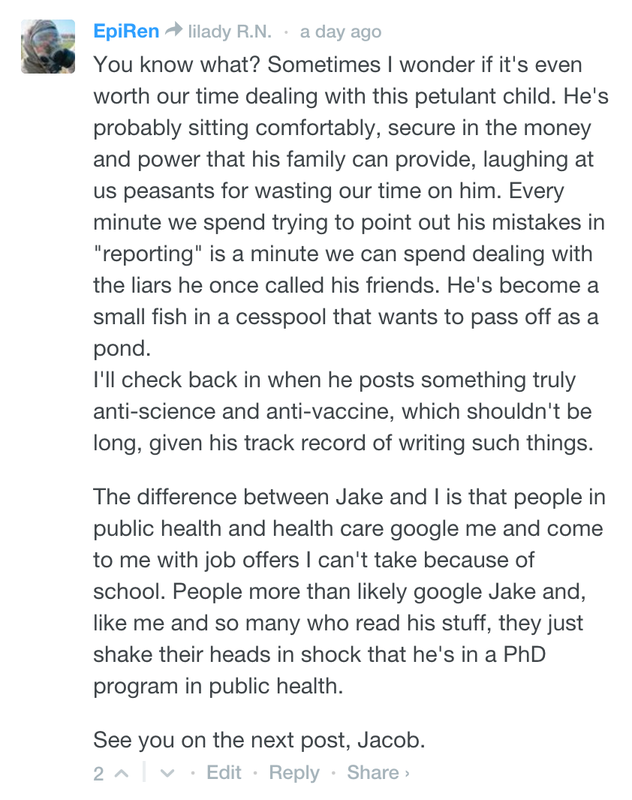 One of the more active anti-vaccine people that I have encountered is one “Jake Crosby“. He used to be a blogger with “Age of Autism,” an anti-vaccine blog devoted to blaming autism and other ailments to vaccines. 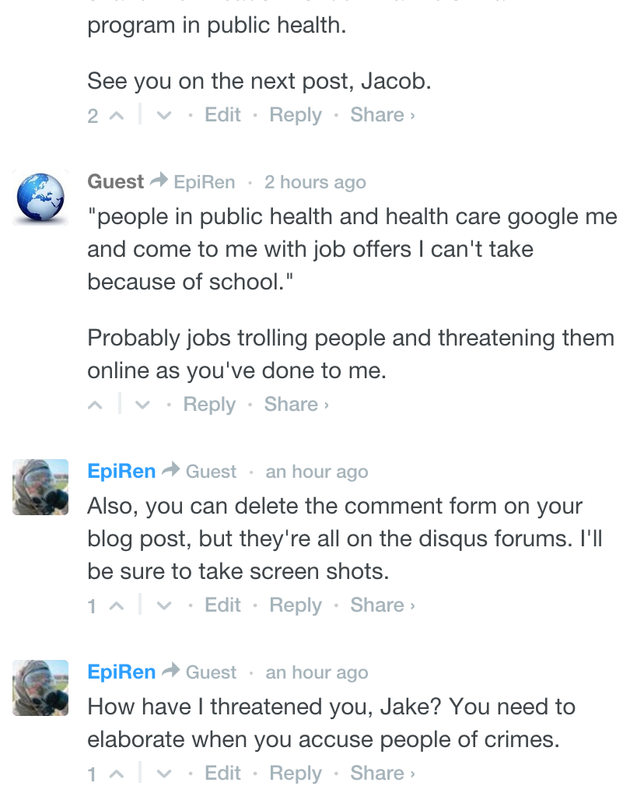 The contributors to that blog get offended when they are called “antivaxxers,” but they also don’t reply when asked which, if any, vaccine they would approve of. Mr. Crosby acts a similar way, but he takes it one step further. He responded by saying I cannot criticize him in person, only online. I found this very ironic. For someone who complains about the internet being a source of misinformation as much as Offit does, he sure doesn’t like being challenged in person. But Dr. Offit doesn’t like my questions, perhaps because he doesn’t have answers. He must have been referring to my response to him at NIH when I pointed out that not every cause of autism had to be prenatal just because he cited several causes that are. He never stated how I had “lied,” and repeated the false accusation that I “stalk” him. For the record, several of the statements about Dr. Paul Offit are plainly false. He was not reprimanded by Congress. He is not a “vaccine industrialist” if we use the common definition for industrialist. Yes, Dr. Offit helped develop a vaccine, and, yes, he was more than likely paid a ton of money for it. (I wish that is the case because developing a vaccine that has saved millions of lives should have some kind of reward.) Yet Dr. Offit has since given the patent rights away and is not getting paid for the vaccine anymore. But this is how the world of an antivaxxer operates, by quickly throwing in misinformation in between the truths. Again, it may all be a matter of perspective. “Like Seth Mnookin did earlier this month, Paul Offit blatantly lied about me while giving a lecture. The congressionally reprimanded millionaire vaccine industrialist told a room full of people I was a “stalker,” and event organizer, Dr. Tara Palmore had me escorted out of the “Great Teachers” lecture given by Paul Offit at the NIH on December 14, now on Videocast. You be the judge. Jake claims to have been escorted or “thrown out” of both events, but third parties saw him leave and even slam the door. It must be a conspiracy that two different objective observers saw things completely differently than how Jake Crosby sees them. It’s become “a thing” of mine to say that something belongs in “Crosby’s Labyrinth” when something is seen completely opposite to how it happened. For example, a 42-23 routing of the Baltimore Ravens is seen as a “snag” by Ravens fans… In Crosby’s Labyrinth. Russia’s invasion of Crimea is seen as an “intervention” by Vladimir Putin… In Crosby’s Labyrinth. The term was coined by Seth Mnookin, by the way. Before we go further, you need to understand something about Mr. Crosby. He sees himself as “toxic”, damaged by vaccines at some point in his life, with that damage resulting in his Asperger’s syndrome. You need to understand this in order to see in context the things that he writes. If I had been convinced that something “damaged” me at some point in my life, I would probably lash out against it as well. I hope that I wouldn’t go as far as some antivaxxers have gone (e.g. lies and deception and demonization of some really good people). But we’re all different, I guess. It is at this point that I reply directly to Mr. Crosby. In his email to the health department where I worked, Mr. Crosby mentioned a similar thing. He mentioned that he was afraid of me because I had threatened him physically. I have never met Mr. Crosby in person. I have never (to my knowledge) been in the same room as he has. I’ve been to DC when he was a student there, but I did not ever run into him in public or in private. 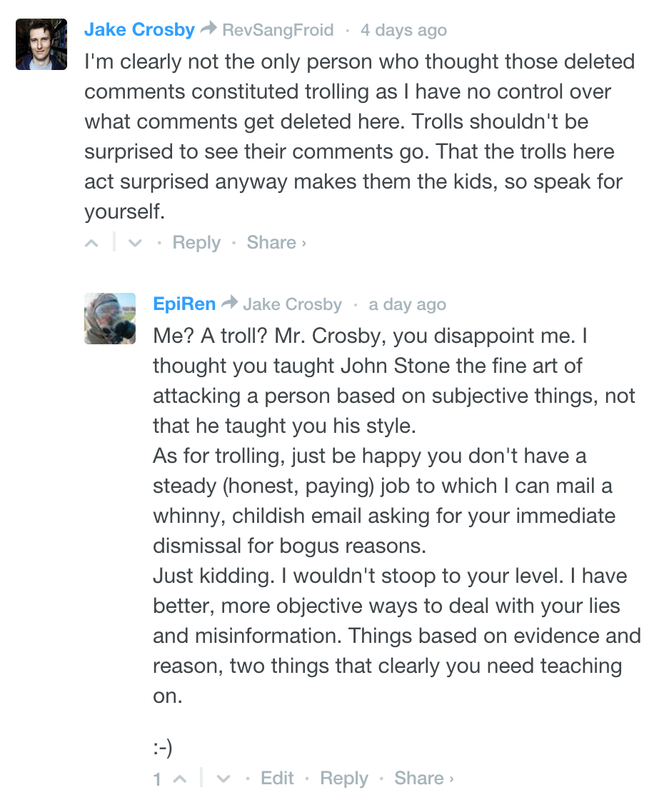 I’ve asked Mr. Crosby to explain how I threatened him, but he has never replied. In fact, I asked again after that comment above. I will not publish his email because it was not sent to me, though I saw a copy of it, and there is a copy of it in my employee file at the health department. My bosses talked with me about it, and they seemed just as confused by the three-page rambling message. (It didn’t flow very well, looking more like a list of grievances about vaccines than anything else.) I’ve asked Mr. Crosby, the sender of that email, if I am free to publish it. He has not replied. If he replies that I can, then it will be up for all to see on another blog post later. Mr. Crosby is only one of many people I’ve come across online in the discussion on the benefits and dangers of vaccination. I’ve come across others in person, and they are very vicious in their personal attacks. They have called me many names and accused me of many things. Like Mr. Crosby, they accuse me of crimes then go extremely silent when asked to elaborate. I meant it when I wrote to Lilady that I wonder how much time I’m wasting trying to get across — or trying to correct — Jake Crosby. At this point, we’re talking past each other and getting into a nasty discussion of each other’s professional and personal attributes, not on the evidence for/against the use of vaccines as measures of public health. It really is a waste of time, so I’m done… For now. 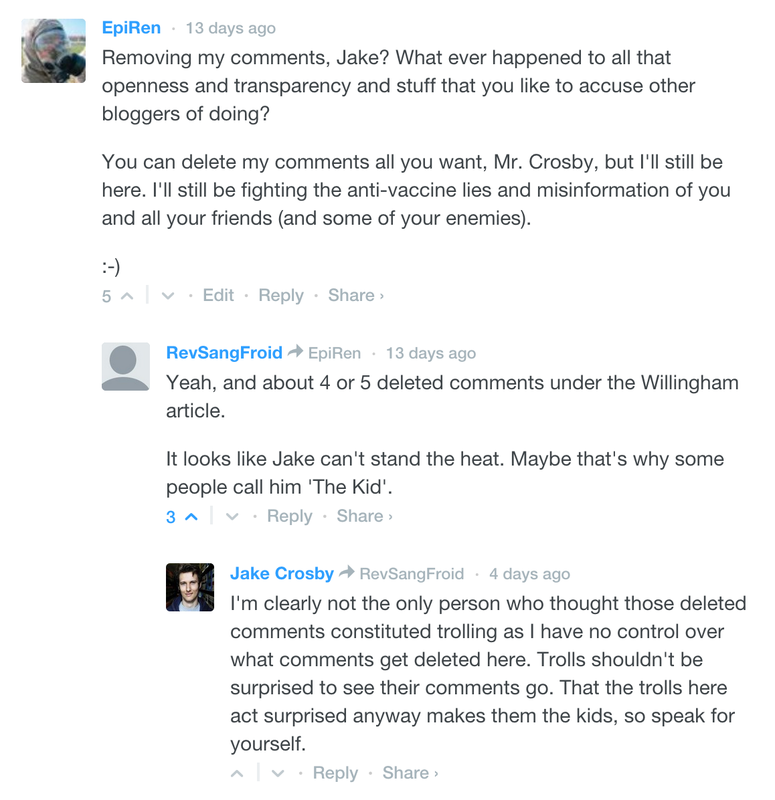 Ooh, I’m the first to post a comment about your excellent (and thorough) posts on Jake Crosby’s blog. 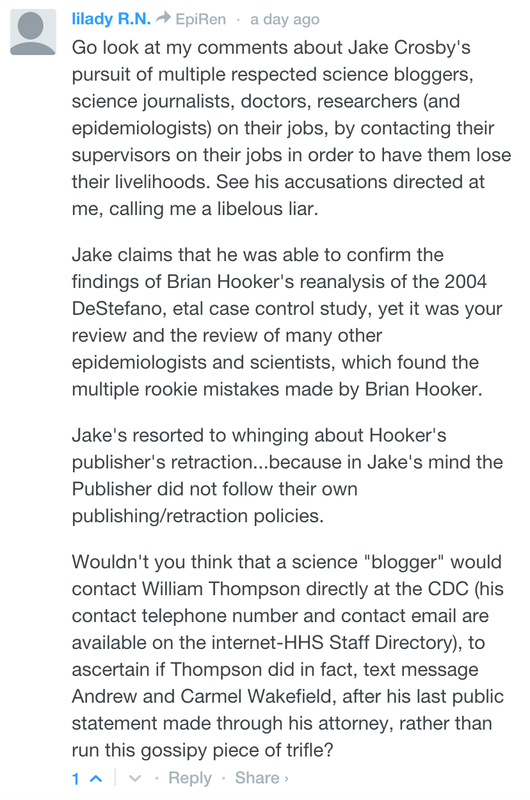 Thank you for setting the record straight about Jake’s long history of personal stalking and cyber stalking our most respected scientists, researchers, physicians, science journalists/science bloggers….and epidemiologists. 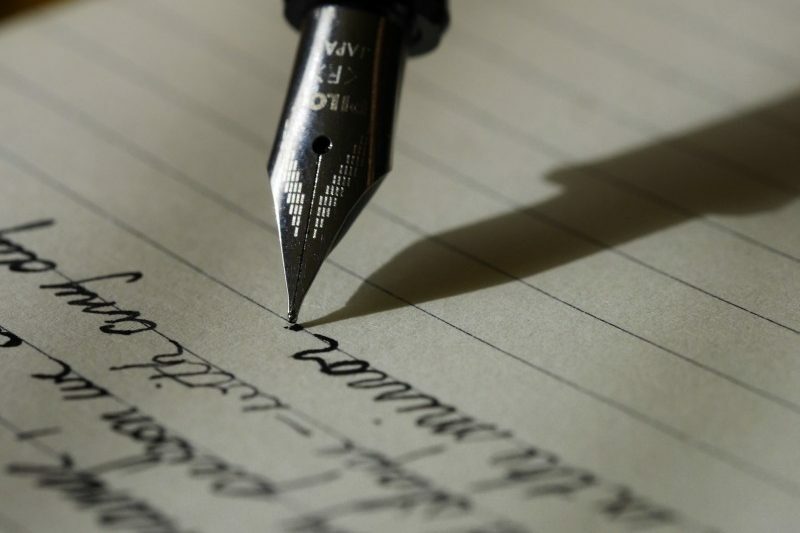 Let’s see if Jake will agree to your offer to publish that three page letter which he sent to your workplace, in a feeble attempt to have you lose your job and your livelihood. I don’t think he will. If that email doesn’t see the light of day, then he can deny that he ever did such a thing. If it does, then his continuous allegation that he has never done such a thing is proven a lie. (Though it’s public knowledge that he tried it with Orac.) It won’t matter to his followers, but it will matter as evidence in a future litigation should one of the people he travels to harass decide to take action.